Think about how often you use your hearing. While waking, and even while sleeping, our ears are constantly alert for sounds informing us about the world around us. Hearing is critical to how we communicate with others and stay connected to people. When their hearing becomes impaired, it can drastically change someone’s life for the worse. Gradually, over the past several decades scientists, doctors and researchers have uncovered more and more connections between hearing and our overall health. One major finding is how hearing loss increases the likelihood of mental health problems and cognitive ability. At the University of British Columbia, researchers have examined statistics from elderly populations and quantified the link between hearing impairment and social isolation. UBC researchers looked at data for subjects aged 60-69, a key age bracket where risks of hearing loss, social isolation and cognitive impairment all experience a significant increase. Seniors are vulnerable to all three of these health issues, but clearer understanding was needed regarding if -and how- they were linked. What the study found was a remarkable connection: for each 10 decibels-worth of impaired hearing, risk of social isolation increased by over 50%. Cognitive ability fared no better. On average, subjects who had untreated hearing loss had accelerated cognitive impairments. Compared to participants without hearing loss, hearing impaired subjects showed nearly a four-year gap in rates of declining function. 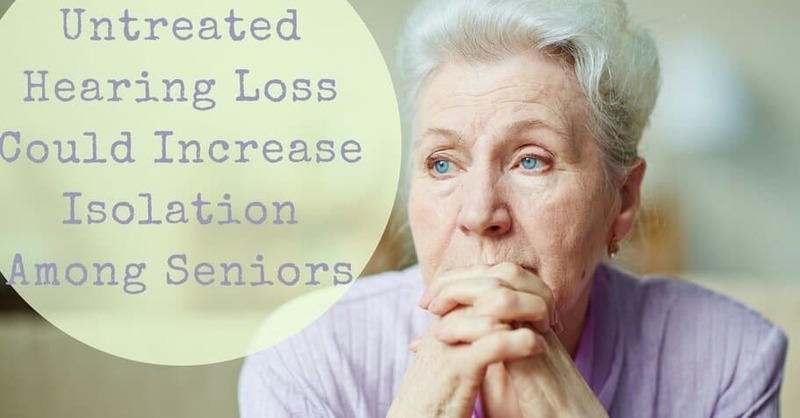 This means that seniors with hearing loss exhibit cognitive losses sooner than people without hearing limitations. Why do social isolation and cognitive disorders pivot around hearing loss? It all has to do with what hearing loss takes away from our lives. When we can’t hear correctly, it harms our ability to understand people and, in turn, to feel understood. The communication gaps that hearing loss creates can become wedges in even the closest relationships with friends and loved ones. As hearing loss increases, the limits of comprehension become more acutely felt, and withdrawing from others can become an instinctual response to the discomfort and frustration of hearing difficulty. Hearing loss makes it hard to place sounds spatially and prioritize sounds in noisy environments. Social gatherings like parties or dinners can be challenges to someone with untreated hearing loss. Hearing loss can make comprehending a social setting so taxing that it actually can condition people to shy away from their favorite activities and entertainment, like movies, sports events or concerts. Avoidance of others and of social settings goes a long way towards encouraging isolation. Cutting off from family, friends and larger community networks is often the byproduct of a decreasing ability to comprehend and engage due to hearing loss. Cognitive problems also progress from untreated hearing loss. When hearing becomes a struggle, the brain has to scramble to fill in missing information in the sounds it receives. Limited sound signals to the auditory nerve makes it harder for the inner ear to process sound. The auditory cortex in the brain also has to work overtime to interpret the signals. As the mind exerts itself to find meaning in sound, it pulls cognitive resources from other functions. Quite literally, hearing impairment distracts the brain away from concentrating on other tasks. Scientists have noticed links between increased rates of cognitive disorders like dementia and Alzheimer’s disease in patients with hearing loss. Untreated hearing loss also increases a person’s chance of having a falling accident. New findings are testing the full extent of hearing losses role and responsibility in cognitive slackening. Although the UBC study’s findings aren’t good news for people with hearing loss, there is a silver lining. Researchers found that while untreated hearing loss was clearly detrimental to cognitive ability, using hearing aids to treat hearing impairment counteracted this effect. Especially encouraging is that when comparing subjects who used hearing aids regularly and people with no significant hearing loss, the cognitive abilities measured between the two groups were almost identical. Although most hearing loss can’t be cured, this is a sign that effective therapy for damaged hearing exists in the use of hearing aids. When it’s time to find help for your hearing, HeaRite Audiological Care is here for you. Our experienced team is focused on giving you expert care and finding the right hearing solutions for your needs.